When I was pregnant with the Little Bird, my cousin’s wife gave me this body-less bunny. It has a bunny head, and instead of arms and legs, it’s a blanket. 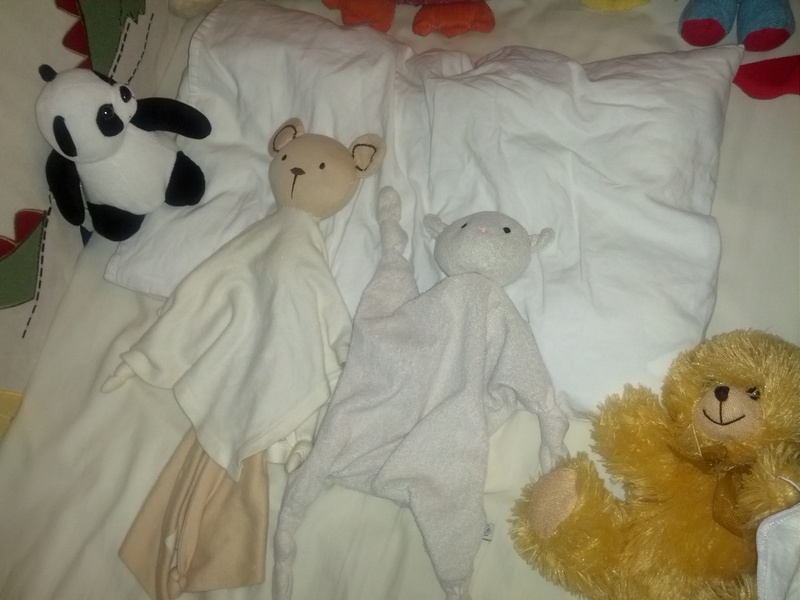 Made from organic cotton, it is soft and snuggly, and soon became one of my daughter’s favourite things. That little friend got dragged around, sewn back up, and has been by her side every night of her life. When I was preggers with the Little Mouse, I wanted her to have the same type of friend. So I bought her a little bear. Again, blanket for a body and bear for a head. Then a friend of mine gave me a little lamb. These two don’t get dragged around as often, but are always in her crib for bedtime/naptime. Their names are also friend and friend. But we all know who friend is. 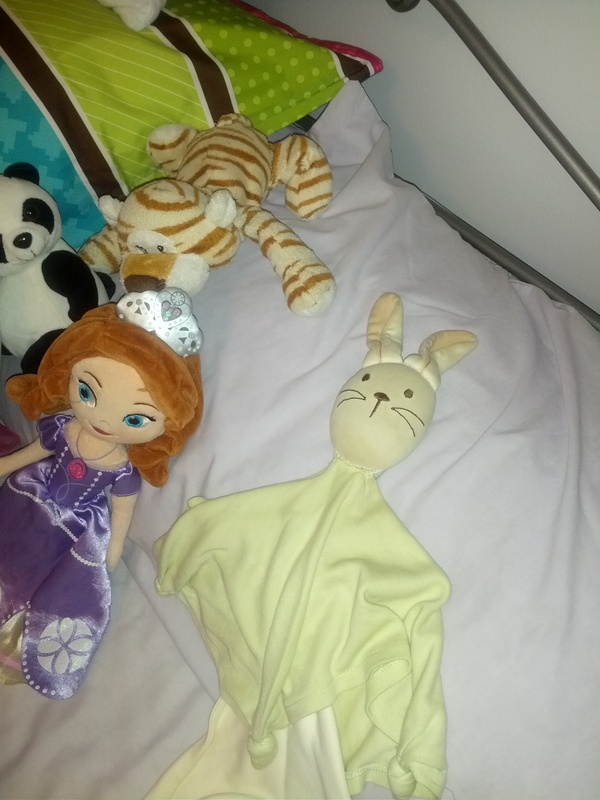 If we mention for them to get their friend, they know which of the gazillion stuffed animals I am referring to. As those are the only friends they have! The rest of them get names like patchy, owl, tiger, Doc, Sophia, Er Shun (as in the female Giant Panda at the Toronto Zoo), Iggle Piggle, fully bear, and the list goes on. I think it’s important to have a couple of those cherished pals as a child. I have plans to preserve these guys (if they last) in a shadow box. I don’t know what state bunny friend or lambie friend will be in, as it’s pretty sorry right now, but I think it’s better than shoving them in a bag and giving it back when they’re 25. Which is exactly what my husband and I received and where some of our beloved childhood friends live; suffocating in a plastic bag, once covered in decades of dust and the scent of “au du basement”. For me it was a lamb, with white fur that was once soft and luscious. Now it lays squashed and matted. I loved that little guy. For my husband, it was bear, who’s face is probably equally squashed. The worst part is they should probably be tossed in the garbage, but we can’t bring ourselves to do it. I don’t know that my kids will appreciate that I’m going to keep these couple of things for them. To me, it reminds me of when they were babies, snuggling with these body-less creatures, the soft cotton on their skin giving them comfort while they slept. Those memories give me comfort. And knowing my lamb is downstairs does too! Do you have a favourite toy leftover from your childhood?